We’re into the Christmas gift-giving shopping season. Here’s a book for the budding Biblical student in your life. One should always be wary of someone who claims to know what another person cares about…but editors Berding and Williams have a good presentation of the methodology here. The goal is to examine what each author wrote as a body of work and analyze it. Obviously, we won’t find here that the Apostle Paul really cared about pizza, but that’s not really an area of New Testament study anyway. 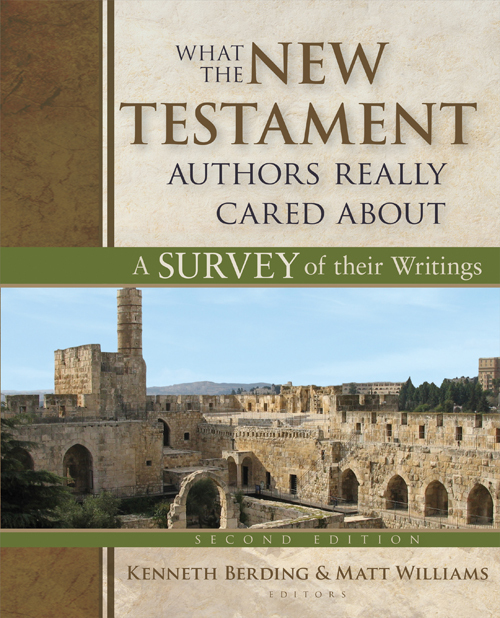 So what is What the New Testament Authors Really Cared About? In a nutshell, it’s a survey of the New Testament like you’d find in either an undergraduate introduction course or a deeper study at church. You have the basic breakdown of authorship, date, and location of writing for each New Testament book. These follow the conservative end of the spectrum, without dealing greatly with the extreme end of the other view—you won’t find a lot of effort to correct ideas like placing authorship of Pauline epistles in the second century. I like the approach. I was a fan of the first edition, which was a softcover, and greatly enjoyed the Old Testament companion volume. The full-color approach is also great for engaging attention and the charts help make some information clear. I remember having to hand-draw charts of where Paul was when he wrote what…or which Old Testament book was quoted most often. Writing style is easily accessible. Rather than aiming for the ceiling or the highly academic, the collection of authors have aimed for the general public. The learning here is not out of reach—it’s not easy level, but it’s not impossible level. Conclusions? As always, there’s a theological bent to everything in the Biblical Studies world. The writers here come down more toward the Reformed theological side, but the facts are not warped to meet that point. The leaning is clear, but that does not detract from the value of the book. I especially like the presentation of the New Testament out of the normal sequence. This challenges the reader to think a little more deeply. All in all, a great book for the growing New Testament student.